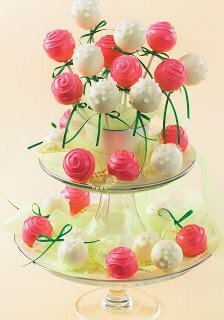 Cake pops can be a work of art and these beautiful Romantic Roses are no different! 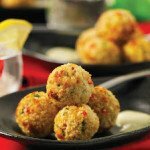 Check out this awesome recipe and get started! Aren’t these beautiful! The sky is the limit with what you could do with them and I just love them! Flowers my husband would appreciate! LOL. These and other adorable recipes can be found in the book 175 Best Babycakes Recipes by Kathy Moore and Roxanne Wyss. You can check out my review here and get your copy here. Create this show-stopping tiered arrangement of cake pop roses for a sophisticated garden fête, a tea party for a special grandmother or anytime you want to set the stage for a stylish occasion. 1. Melt 1⁄4 cup pink candy melts (see page 18) and use to attach sticks to 6 cake pops (see page 27). Freeze cake pops for at least 15 minutes to set. Reserve the remaining candy melts. Repeat with white candy melts, attaching sticks to 6 cake pops (8 to 12 cake pops will not have sticks). 2. Add 1 cup pink candy melts to those left in the cup and melt until smooth. Coat the cake pops secured with pink candy melts. Set in a cake pop stand to dry. Using the fork tool, dip half of the cake pops without sticks and place them on a wire rack set over a sheet of foil or waxed paper to dry. 3. Add 1 cup white candy melts to those left in the cup and melt until smooth. Coat the cake pops secured with white candy melts and immediately sprinkle with sugar pearls. Set in the stand to dry. Using the fork took, dip the remaining cake pops without sticks and place them on the rack to dry. 4. Reheat pink candy melts, adding more as needed. Use the pastry bag to pipe a swirl in a tight circle on top of each pink cake pop (with and without sticks) to resemble a rose bud. Set cake pops with sticks in the stand to dry. Set cake pops without sticks on the rack to dry. 5. Use craft glue to glue one candlestick to the bottom of the dinner plate to form a large pedestal. Glue the other candlestick to the bottom of the soup bowl to form a smaller pedestal. Let both dry. 6. Place the small pedestal on top of the large pedestal. Place the sugar bowl on top of the small pedestal. If necessary for stability, glue everything together. Decoratively arrange tulle over the bottom two pedestal layers. 7. Measure the dimensions of the sugar bowl and trim the Styrofoam to fit snugly and be about 1 inch shorter than the bowl. Place Styrofoam in the bowl. 8. Cut ribbon into twelve 7-inch lengths (there will be ribbon left over). Tie a bow around each cake pop stick. Slide bows up to just below cake pops. Push the cake pop sticks into the Styrofoam, arranging the roses at different heights. Fill in around cake pops with small pieces of tulle, hiding the Styrofoam. 9. Arrange the cake pops without sticks in the tulle on the middle and bottom layers. Cut the remaining ribbon into 8-inch lengths and tie small bows with long tails. Arrange the bows next to the cake pops so that the ribbon flows off the plates. Drape pearl strings around the cake pops on the bottom two layers. It looks especially dramatic to place just one cake pop without a stick on one side of the middle layer, positioned beside a bow with especially long tails. Inexpensive glass candlesticks and individual pieces of china can often be found at thrift stores, flea markets and estate sales. Even mismatched pieces can combine for an attractive look. You can substitute tiered glass cake pedestals in graduated sizes for the china and candlesticks. To complement this centerpiece, fill matching teacups with additional cake pops on sticks, decorated to match the large arrangement, and set the teacups around the room. 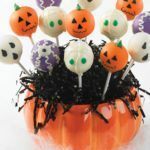 Make enough cake pops so that each guest can eat one at the party and take one home as a favor. Capture the days of wine and roses. For a beautiful evening, begin with a Romantic Roses centerpiece, then serve a bottle of Champagne, Prosecco or your favorite wine in your best wineglasses. Pure romance. Excerpted shared with permission from 175 Best Babycakes Cake Pop Maker Recipes by Kathy Moore & Roxanne Wyss © 2012 www.robertrose.ca Reprinted with permission. All rights reserved.